Pahela Baishakh or Poila Baisakh is the offspring of Bengali New Year in India. The Hindu festival date is decided according to the lunisolar Bengali calendar as the first day of the first month, Baisakh. Majorly it Poila Baisakh falls on April 14 or 15 every year, according to the Gregorian calendar. Again, on the same day, people in other regions observe traditional solar new year and a harvest festivity by Hindus and Sikhs. The festival is celebrated with fairs and family time, with Bengalis greeting each other as "Shubho Nabobarsho." 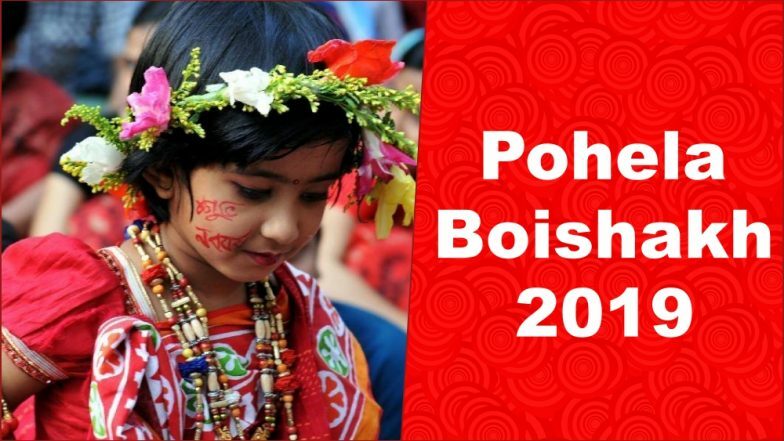 As the day is approaching fast, know the significance, rituals, date and everything about the Bengali New Year, popular as Poila Baisakh 2019. Best WhatsApp Stickers, SMS, GIF Image Greetings, Quotes and Wishes for Vasant Navaratri. The moment the year draws to a close, people in the Bengali community visit their nearby bookstalls to book a copy of Panjika, the Bengali almanac. It is a year-long handbook for the Bengalis to keep up with all the festival timings, favourable days, auspicious dates for everything including the best time for weddings to housewarmings. With the help of Panjika, they get to unfold many things that the Bengali New Year has to offer. The date as to when the Bengali New Year begins, always changes. However, Pahela Baisakh or Pohela Boishakh usually falls on April 14 or April 15. According to the Hindu lunisolar calendar, this year, Bengalis all across will celebrate Poila Baisakh on April 15. Historians attribute the Bengali calendar to the 7th-century king Shashanka. It was later modified by Mughal emperor Akbar for tax collection. During the Mughal era, land taxes were collected from Bengalis as per the Islamic Hijri calendar. This calendar was a lunar calendar and its new year never coincided with the solar agricultural cycles. It was Akbar who asked the royal astronomer Fathullah Shirazi to create a new schedule by combining the Islamic lunar calendar and solar Hindu calendar, already in use. This was known as Fasholi shan (harvest calendar). Some historians claim that this initiated the Bengali calendar. Although unsure of who adopted the Bengali calendar and the new year, it is said that the creation of a separate calendar helped collect land taxes after the spring based on its dates. The Islamic Hijri calendar created administrative difficulties in setting the collection date. In Bengali, the word, Pahela or Poila means, 'first' and Baishakh is the first month of the Bengali calendar. Again they greet each other saying, Shubho Naba Barsho where naba means 'new', barsho means 'year'. Some legends state that the Bengali festival of Poila Baishakh is related to the traditional Hindu New Year festival called Vaisakhi and other names in rest of the country or about the same dates. Vaisakhi, also spelt as Baisakhi, is celebrated by both the Hindus and Sikhs. Bengali people in India have historically celebrated Poila Baisakh, and it is an official regional holiday in West Bengal and Tripura. Just like how the rest of Indians welcome the New Year, Bengalis too clean their house and adorn themselves in new clothes. They even decorate their home by creating alpana (traditional artistic patterns) on the floor, which adds more charm to the festivity. And of course, no festival can ever be complete without the delicious traditional food. Ilish maach (ilish fish), rice, chanar dal,dhokar dalna, and many other vegs and non-veg delicacies are prepared across all Bengali households as they welcome the New Year.